Seafood lovers will find shrimp, crab, scallops, oysters and other fish prepared enough different ways to never get bored with dishes from the depths on South Padre Island. The island is the place to get a really good shrimp and oysters po’boy, a fried-shrimp basket, crab-finger appetizers, et al. However, as of late summer 2018 there is also a gourmet restaurant on the island to please sophisticated palates. Called F&B SPI (food and beverage), the restaurant’s white walls, open spaces and high ceilings exude a cool, chic aura. But don’t worry about being under dressed. It’s on an island where shorts, patterned shirts and sandals mingle with classy slacks, long skirts and lightweight shawls. Foodies come to F&B for striped bass, whole salt crusted fish, seafood risotto and specials such as lamb loin and lamb chops. 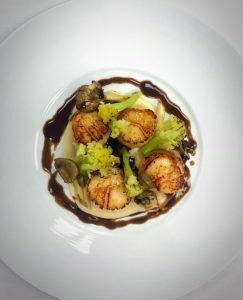 I’m a sea scallop seeker so I had wonderful, seared sea scallops with cauliflower puree, oyster mushrooms, cauliliani and balsamic brown butter sauce. A friend had the seafood risotto with lump crab, shrimp, scallops, clams and Arborio rice. We shared and loved both dishes. We should have eaten less though because we had to try the desserts. I liked the chocolate soufflé which I ordered ahead but also had to have a decadent Adult Cookie and “Milk” which really was a chocolate stuffed cookie accompanied by a Mozart white chocolate liqueur. 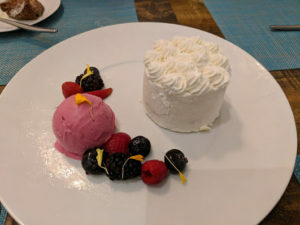 We also shared the refreshing Ligurian lemon olive oil cake with wild berry gelato, wild berries and Chantilly cream. The restaurant is owned by Chef Walter Greenwood and his fiancé Brandi Hackett who runs the front of the house in partnership with brothers Scott Friedman who has Pier 19 and Pirates Landing, the two places to get tasty po’boys and shrimp baskets, and Bob Friedman whose Sea Ranch has terrific seafood appetizers, red snapper and grouper. 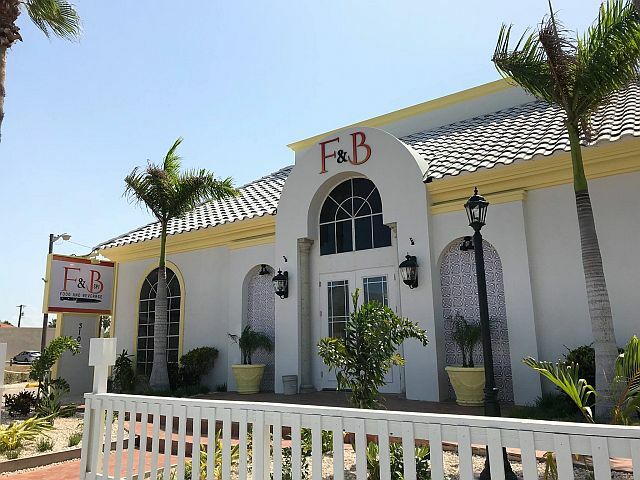 F&B is at 3109 Padre Blvd, South Padre Island, Texas 78597. For more information call (956) 772-8114 and visit F&B.